Emma Kennedy 's painting of Orpheus, and mine on the bottom of Eurydice. To be embedded in a larger altarpiece created by Paula Pino for the Principle Gallery Charleston in November — with Seamus Martin and Sihame SB. I decided to restart Sarah Deaner's portrait. Usually I'm against chucking and restarting, so I repaint often and try to persevere when things go badly. There seems to be a bias against doing this-- somehow reworking too much takes away the painting's "freshness"? I don't know if I agree with that, and certainly x-ray studies of paintings reveal that artists reworked things quite a bit. The problem with reworking, however, is that with every subsequent layer of paint, the values get darker, so if you want to end up with something that is light in value, reworking might not be the best strategy. In the painting of Sarah, I wanted to blow out the value spectrum and exploit the range as much as possible, but the range was shrinking with every subsequent rework. Why did I need to rework? I wasn't very happy with the drawing, and I wasn't working from the model at the painting stage, but rather working on colors from my imagination, and I rushed in without a good conception of what I wanted the colors to look like (a color study would have been useful before diving in), which meant I wasted a lot of time pfaffing and rethinking. Anyway, here is the new underpainting, which I started also in a different way which I hope will be more interesting than what I was trying to do before. I found this painting "Self-Portrait (1902)" by Welsh painter and one-time student of Whistler's Gwendolen John on Wikipedia. I have been to the Tate a few times but don't remember this painting. The technique isn't exquisite or anything, but I love the introspective feeling of the painting. I like the green and red color combination in particular. Both the models I'm using right now are red-headed, so I might try a similar color combination on one of my paintings. The story: King David, from the roof of his palace, spied Bathsheba, the wife of Uriah, taking a bath. They got it on and she got pregnant. My friend, the art historian Susannah Rutherglen sent me this wonderful detail of Giorgione's Judith. I love the decorous and feminine way Judith is holding the sword. The little pinky finger is priceless. 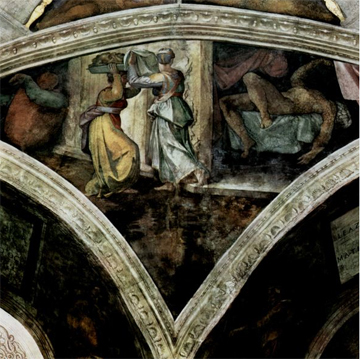 Susannah is writing on Venetian furniture paintings and wrote me that Giorgione's Judith "originally decorated a door and had traces of a keyhole and hinges at one time." Happy New Year, everyone. I haven't posted in a couple of weeks because of the holidays, but I'm back in the studio and in front of the computer. I hope you passed a wonderful holiday season. The advantage of getting out of the studio for some longish period of time (for me, about two-and-a-half weeks, which seemed like a century) is that when you get back, nothing but an earthquake can keep you from working again. My family and I took a trip to Rome for Christmas and celebrated Midnight Mass at St. Peter's Basilica in the Vatican, which was, of course, amazing. My parents balked a bit when I decided to make this career (and life) change a few years ago, but they are coming around now, and Rome was the perfect place to underscore the kinds of feats of cultural excellence artists can achieve under friendly circumstances (read: massive patronage). Besides taking in the magnificent Sistine Chapel and the spellbinding Caravaggios littered all over the city in palazzos and churches, I enjoyed an hour alone in the Pinacoteca, or picture gallery, in the Vatican Museums. There, I discovered the most arresting "Judith and Holofernes" I've ever seen, painted by an artist hitherto unknown to me: Cristofano Allori. 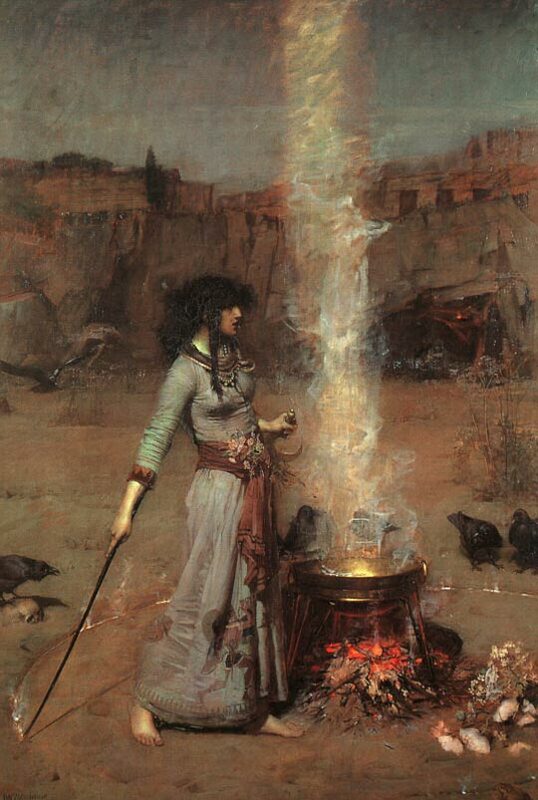 As you may know from a previous post, I don't usually take photos when I visit a museum, but I really regret not taking a picture of this painting because I have scoured the internet and no reproductions come close to doing this piece justice. Apparently there are two versions of this painting: though I cannot confirm it I believe that the painting I saw was the one that originally hung in Florence (I don't know when the Vatican acquired it). Web images show another, very similar painting, but with Judith's head slightly more cocked to her right side (this hangs in the Queen's Gallery in London). I prefer the gesture of the painting I took in: it was more direct and less tentative, and thoroughly appropriate given the deed she has just committed. I want to say two things about this painting: First, the values (range of darks and lights) are masterful. There are three heads here: Judith's, Holofernes', and the upraised head of the accomplice/maidservant. The quick little compositional sketch I did of the painting isn't consistent with the image I pasted above: the actual painting has about 20 percent more canvas above Judith's head, and it's almost completely black. However, the black space serves to heighten the drama of the composition, and successfully sets off Judith's head. 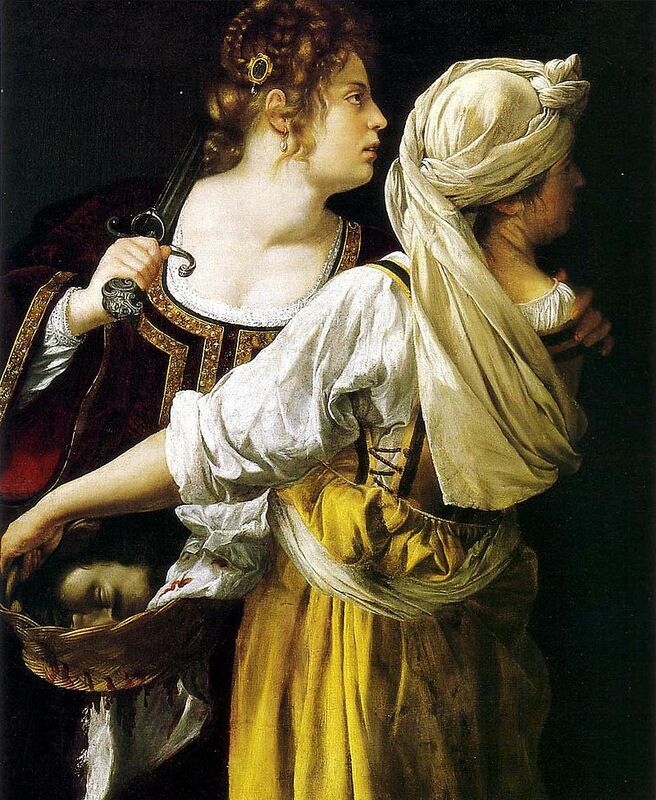 Although the heads are painted in relative mid-tones, they are not forgotten, and the whites of Judith's sash and the head scarf worn by the older woman serve to balance one another. 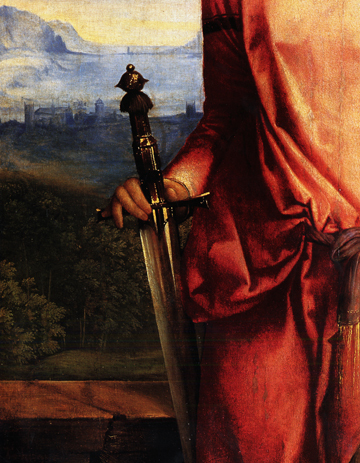 It is not very clear from this image, but Allori chose to cut off the sword (i.e., not include the whole thing)-- it vanishes off the canvas and into the blackness behind Judith. Second--and this is the most frustrating thing about this image-- I wish there existed another such model as the one Allori used (his mistress, Mazzafirra). In the painting Allori captured a Judith who is calm, but also searching. Her eyes were slightly Asiatic and just absolutely beautiful. Anyone going to Rome with a camera some time soon? Here are some fast facts about Allori: he painted in Florence in the late 1500s, early 1600s, and his father, also an artist, was his first teacher. I have looked for tidbits about him on-line, but unfortunately every article about him has been lifted from this one source, and I don't want to regurgitate it here. Above by Artemisia Gentileschi, "Judith Slaying Holofernes" (1620). 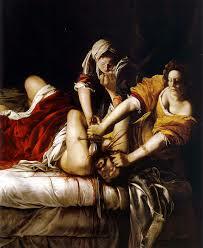 Above also by Gentileschi, "Judith and Her Maidservant" (1613-14). 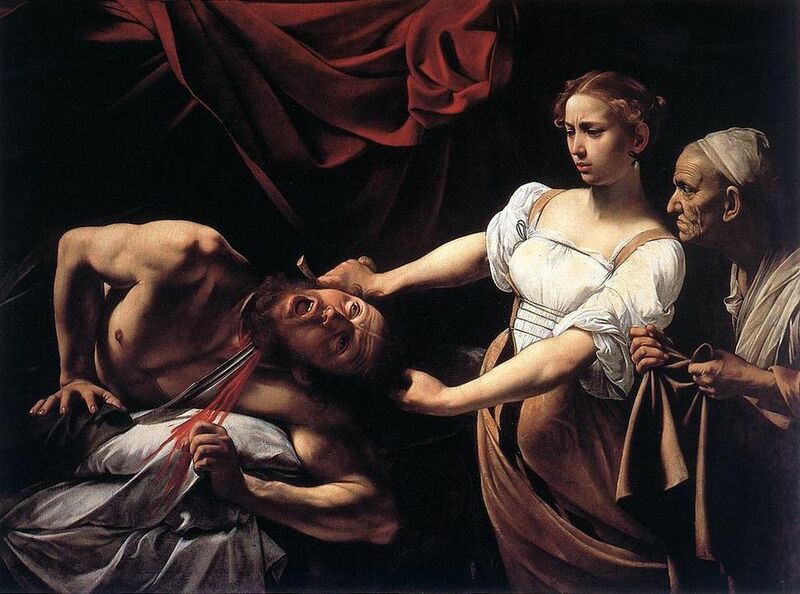 Above by Caravaggio, "Judith Beheading Holofernes" (1598-99). Above by Michaelangelo, the Sistine Chapel (1508-1512). Above by August Riedel, "Judith" (1840). There are many more Judiths out there -- Giorgione, Vasari, Paul Albert Steck, Klimt, and may be even a Marriage-Song one day. In the near future I plan on painting another Biblical beheading temptress, this one from the New Testament: Salome. Last week Wilmot Kidd, Kristin Kunc and I dropped in on the Metropolitan Museum of Art's exhibit "American Stories: Paintings of Everyday Life: 1765-1915". The exhibit is small and there are only a few real gems in it given the low state of American painting technique in the 18th and 19th centuries. I came out of the exhibit however with a new appreciation of Winslow Homer, whose "Veteran in a New Field" (1865) was one of my favorites in the show. The composition is three horizontal stripes, the monolithic sky being incredibly abstract, the lone figure cutting through the three rectangular planes (sky, grains, ground) just as he cuts through the grains with his long scythe. I liked the handling of the white shirt, which is painted incredibly thickly, which Kristin pointed out had to be the case given that the artist was painting with lead white.